Here’s the original “Bobby Effect” article on OLIP website. Can you imagine moving across the world, with no job and no professional network? It’s a daunting thought, and for many skilled newcomers to Ottawa, it’s not just a hypothetical question; it’s their reality. This is where OCISO’s Career Mentoring programs come in. 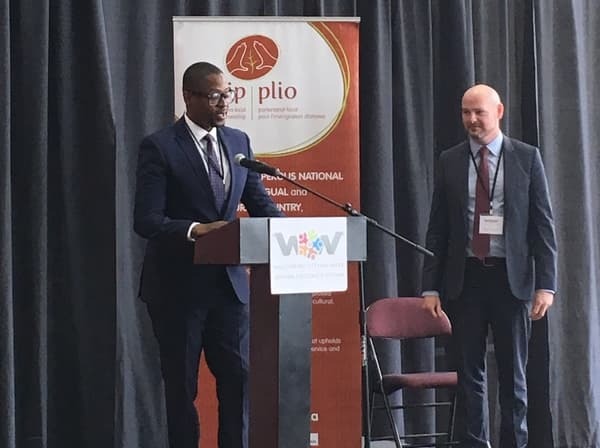 OCISO’s Career Mentoring and Federal Internship for Newcomers (FIN) mentoring programs provide newcomers with opportunities to expand their professional networks as well as provide support to internationally educated professionals seeking to secure employment in their field. Both the Career Mentoring and FIN mentorship programs rely on dedicated volunteer mentors to offer newcomers the chance to obtain meaningful employment in their new home. 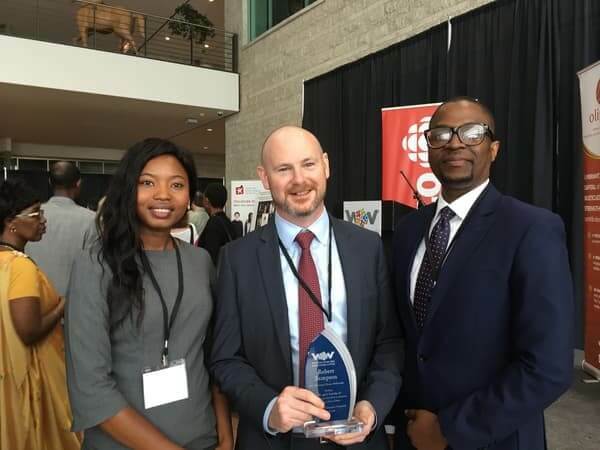 His mentees appreciate the Bobby Effect so much they nominated Robert for a Welcoming Ottawa Ambassador award (part of activities to celebrate “Welcoming Ottawa Week” [WOW] 2018), recognizing Ottawa residents who go out of their way to support newcomers in their daily efforts to make this city their new home. At a special WOW presentation at City Hall, Robert was recognized alongside other Ottawa residents and received the WOW Ambassador award. Within six weeks from their first mentorship meeting, Ayokunle had secured a great position within his dream organization – far better than the jobs he had originally applied for. Ayokunle considers OCISO and his match with Robert to be the game changer for him. Great CBC interview with Ayokunle, Clémence and Bobby! Former FIN intern Clémence Naré is another newcomer who benefited from the Bobby Effect. Robert was on the case even before he met his extremely accomplished mentee from Burkina Faso who has multiple degrees in law and public administration. Although Clémence had a remarkable caliber of experience, Robert recognized the importance of tailoring her impressive CV to the jobs she was seeking. It was likely that without this customization, employers would consider her over-qualified and her CV could potentially be disregarded. Robert also noted that as with most newcomers, Clémence was not familiar with public service human resources competitions. Important concepts – such as essential qualifications, asset qualifications and organizational requirements – were foreign to her, and this is where he saw an opportunity to offer support. Clémence’s resume indicated an interest in teaching law. Suddenly the bells went off in Robert’s head. Just a week before he and a law school friend had gone for coffee. His friend mentioned a possible teaching opportunity with a local university. Robert saw a natural fit for Clémence, and with her permission, forwarded her CV to his friend. Very quickly after this, Clémence’s resume was passed along to the human resources department at the university. All of this happened even before Robert had met Clémence! After they met, they worked on tailoring her CV, made lists of public services entities that may be a good fit, discussed alternative options, talked about cover letters and practiced mock interviews. They shared laughs and had a lot of fun together. For Robert, mentoring means so much more than having fun. He quickly learned to admire Clémence’s tenacity, modesty and work ethic. She diligently sent out application after application, note after note and thoroughly prepared for their meetings and any interviews that were offered. Like Robert, other mentors have expressed a desire to make a positive impact on someone’s life, and to help others find success in their career journey. Volunteering as a mentor with OCISO offers people the opportunity to give back to the community in a meaningful way, and have fun while doing it. Prepared by Tonya Pomerantz, OCISO Mentorship Facilitator, tpomerantz@ociso.org.